WASHINGTON (Reuters) - The day after his party lost its lock on the U.S. Congress, President Donald Trump walked into a White House press conference ready for political combat, name-checking Republicans who he blamed for losing their seats and lashing out at reporters who challenged his assertions. Republicans lost control of the House of Representatives to Democrats, but Trump shrugged that off, casting Tuesday's congressional election results as "very close to complete victory" for Republicans and saying he could negotiate easier on some issues with Democrats, anyway. Republicans kept their Senate majority. Trump briefly sought to strike a statesmanlike tone in his first public remarks after the loss, praising House Democratic leader Nancy Pelosi for her hard work and envisioning "a beautiful, bipartisan type of situation" on infrastructure investments and health care. But his news conference, which stretched close to 90 minutes, quickly turned raucous when some reporters pushed him on whether his campaign rhetoric on migrants from central America was divisive - and on developments in a federal investigation into Russian interference in the 2016 presidential election and any coordination between Moscow and the Trump campaign. 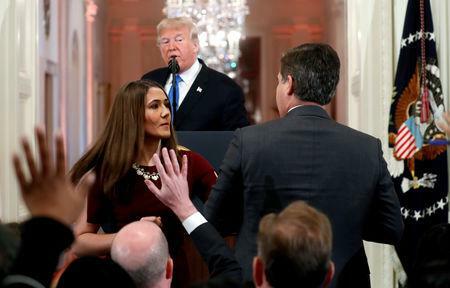 "CNN should be ashamed of itself, having you working for them," Trump told CNN correspondent Jim Acosta, who wrestled with a White House staffer who forcibly pulled the microphone from his hands. "You are a rude, terrible person," Trump told Acosta. He scorned Utah's Mia Love and Virginia's Barbara Comstock. "Mia Love gave me no love," he said. "And Barbara Comstock was another one. I mean, I think she could have won that race, but she didn't want to have any embrace."